First dandelion bouquet from my little girl. Kate prefers her own style. Last week, Seth and I read this about this story in our Children's Bible Story book and I was so glad that the author, Catherine Vos made it a point to show how God worked to bring about that which He had determined He would do. "When Absalom and his friends heard this advice, they thought the counsel of Hushai better than the counsel of Ahithophel. It really was worse but God made Absalom prefer Hushai's bad advice, to save David's kingdom from his rebellious son." In my Bible is a note indicating that David has previously asked God to frustrate Ahithopel's advice to Absalom back in 2 Samuel 15:31. So this appears to be a perfect example of David's prayer being answered because God had determined to end Absalom's kingdom-stealing ways. When people oppose the biblical idea of God's absolute sovereignty over all, man's will included, they often protest that this makes man nothing more than a puppet or robot. However, the Bible gives us many clear examples where God's will is accomplished by man without him ever being aware that he is conforming to God's predetermined purposes. We have no indication in this passage nor anywhere else that Absalom felt he was acting merely as a puppet to God's plan. No, what we see here is Absalom acting exactly the way he desired, but also according to God's determined plan for him. Absalom did not frustrate God's plans. God easily brought to pass that which He desired from the beginning and that which David had prayed for. This past weekend as I prepared my Sunday school lesson on the tenth plague and the Israelite exodus out of Egypt, I saw again how God worked in the hearts of the Egyptian people. This passage is the fulfillment of what God has told Moses would happen back in Exodus 11:1-3 when he was giving Moses his instructions. Not only did God cause the Egyptians to think favorably of the Israelites and give them gold and silver items, but also caused Moses to be highly regarded by Pharaoh's officials and the people. I have previously suggested further reading about this topic and related issues here. I close with a verse that stuck with me years ago as I began to desire to study God's Word and really know for myself what it taught. I lost almost all my original seedlings so a replanting was in order. I now see that I have a different problem if even half of these lettuce seedlings survive and thrive. Space! And they are only one kind, I still have a different variety to re-pot later today. Also, I had been planning on buying Romaine plants to supplement my immature seedlings to get us started eating our own lettuce sooner. Yikes! The upside is that because I pick the leaves when they are young, the plants do not take up the space that a mature head of lettuce requires. The yellow bowl in the middle of the table contains a very small tadpole with a large piece of algae for its food and comfort. He came from our neighbor's neglected fish pond which I think is currently hosting everything but fish. Clearly, my library loan request came in just in time to help Seth with his tadpole and also his ant jar which he is planning to re-do today since he discovered the ants grappling with each other in a death grip last night after dinner. Shane suggested he let them loose. Apparently you need to pick ants from the same colony to avoid them attacking each other instead of working to make new homes. I think I can see parallels in the history of human civilizations without too much difficulty. 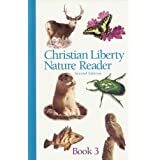 Seth's current interest in ants is due to the opening chapters of Book 3 of the Christian Liberty Nature Reader which is a series I highly recommend and can be found here. 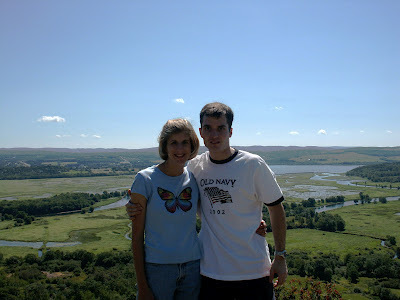 This past Thursday, Shane and I celebrated our tenth wedding anniversary. He put together this wonderful video of some of our favorite memories. I did shed a few tears when he premiered it on Thursday morning. The soundtrack is from his favorite band, Switchfoot and the song is called "Souvenirs", hence the title of the video. We have watched it many times already and coming home in the car yesterday, we were listening to the Switchfoot cd and this song came on and Laura immediately asked to watch the movie, "my movie", she said. Shane and I were quite surprised that she already connected the music to the video. Shane said he'll have to make more movies for her to watch. This is a slightly edited version with the locations removed for privacy. Enjoy! With Mother's Day coming, I mailed several handmade cards this week. degree earned by my sister-in-law after many years of hard work. I bought the paper flower and added floss thread to make the center. And the leaves are just pretty stickers. Happy Anniversary, Shane! I love you. *garden garlic; oak tree; busy bee and flowering shrubs. I'm slightly obsessed with the cardinal that sings and calls from the trees around our home. So I was excited when he was right in our backyard cedar singing his heart out and even gave us a clear glimpse of himself. And as you will hear, I wasn't the only one who got excited! Click on the image for The Backyard Birdsong Guide and scroll down to read the paragraphs under Why Birds Sing which provides some interesting insight into bird calls and songs. This is a warning that a certain amount of excitement is about to be expressed over things like spelling rules, phonics, and handwriting ideas. But first, a little context to put this excitement in perspective. I went to college to learn how to be a teacher. Thousands of dollars later, I earned a certificate that proved I was qualified to teach in the state of Pennsylvania and at least twenty others. I began as a tutor for Sylvan Learning Center following graduation and looked around for a Christian school to practice my trade. The following year I took a position in Philadelphia as a fourth grade teacher in a school started by converted Jewish families, with a few Gentiles thrown in for flavor. One of my students joining us after the school year started was a struggling reader who I attempted to tutor while the other students were in their Hebrew class. I picked a list of the 100 most frequently used words and got to work. It was frustrating for both of us, although he was a well mannered boy and never disrespectful. At some point, our tutoring times petered out and his reading level never did improve much after his year in my classroom to my own shame. I share this story because after all these years, I now see very clearly why I failed to help him. I unintentionally withheld the code he desperately needed to decipher the English language. This code of knowing what sounds our letters make alone and in groups, which is most often referred to as Phonics. When I was initially preparing to teach Seth how to read, I became increasingly aware that I never really had taught anyone to read before despite being a certified teacher and to make matters worse, I didn't even know HOW to really teach someone to read. It was in these early years of homeschooling research that I began to really doubt the usefulness of my college degree. Four years into homeschooling, I am utterly convinced that my teaching degree taught me nothing other than classroom management, which I could have learned in one short afternoon lecture. And to make matters worse, people like my hygienist who chat with me about my kids and home life always assume that I am qualified to homeschool because I have a teaching degree. I try to tell them but they cannot understand that my teaching degree has nothing to do with our decision to homeschool and has not contributed much if anything to our lessons at home. I have had to start from scratch just like most parents. It has been a very humbling experience. As Seth and I worked together on helping him become a confident reader, I became very aware of all the educational products that crowd the shelves touting phrases like "Phonics-based" or "Fun Phonics". As I would peruse these items online or in-store, I quickly realized that 99% of those workbooks, flashcards and games were "Fake Phonics". Among other issues, they relied on things like picture cues which were often misleading and inconsistent. I struggled to find simple books that Seth could read to practice sounding out the short and long vowel sounds as most "early/beginner reader" books included many words he couldn't sound out yet. Thankfully I came across the Bob books and that helped bridge the gap to other more experienced reading. After a disappointment with our initial spelling program, I have been delighted with the kind of understanding All About Spelling brings to mastering the code. We have learned spelling rules that have brought much clarity to me as a mature speller. Many of those "a-ha" moments where I thought, for example, I knew the reason for the "silent e" but didn't really. So as I came upon this recent post by Brandy about a lecture she was listening to entitled The Logic Of English, I thought I might be missing a major component to our Phonics/Spelling instruction. Turns out, Denise Eide advocates for the same phonics and spelling rules as All About Spelling. Can you spell r-e-l-i-e-f? I have been reading through her book Uncovering the Logic of English and find it to be a very helpful companion to my spelling curriculum since she discusses the same material but with much more depth for older learners(and teachers). Some changes I anticipate making with my girls' phonics instruction is working on recognizing the lowercase letters first, although since we've already started on the uppercase, I will actually be teaching both but with more emphasis on lowercase letters since as Denise points out in her seminar, they occur much more frequently than capital letters. She also makes a case for teaching cursive writing first before print and I may follow her advice on this as well. I have some time to play around with this yet, but I am mulling it over. But most importantly I am eager to help the girls learn all the many different sounds of our letters and letter combinations make and not just treat them like strange exceptions that make English seem chaotic and inconsistent. For example: If I asked you, "What sounds does ch make?" what would you say? Go ahead and think, I'll wait. So far everyone I've asked has correctly answered(as I would),/ch/ like "church" and then looked stumped as to any other sounds. So I get the fun part of saying, "Yes, but it also says, /k/ and /sh/ like in "school" and "choir" and "chef" and "chateau" respectively." The /sh/ sound of ch is because they are French words we've borrowed. All About Spelling does do this with ch(and many others), although each sound is worked with independently and not simultaneously to avoid confusion, but the three sounds are introduced together and practiced as the three sounds of ch. According to her lecture, Denise reports that English is currently the most verbose language with close to two million words. She says that German is the next closest with 200,000. That is an incredible amount of sounds and words to learn and use correctly. And the amount of order and consistency that is present in our language is something to be proud of, instead of embarrassed when a true exception to a rule is found. Many commonly thought exceptions are actually just misunderstood and overlooked rules that we do not bother to teach or learn. If you do nothing else besides reading this post, I urge you to take the time to go and listen to the two seminar lectures by Denise Eide, linked in the above paragraph. I cannot help but think it will change the way you think about the orderliness of English as you use letters and words each day. The Sentence Family, previously written about here. And for a little humor, here are two scenes from My Fair Lady.